The Photo Memories bonus triggers when players land two photo memory symbols on reels 1 and 2, along with Rockin’ Respin symbols on reels 3, 4 or 5. 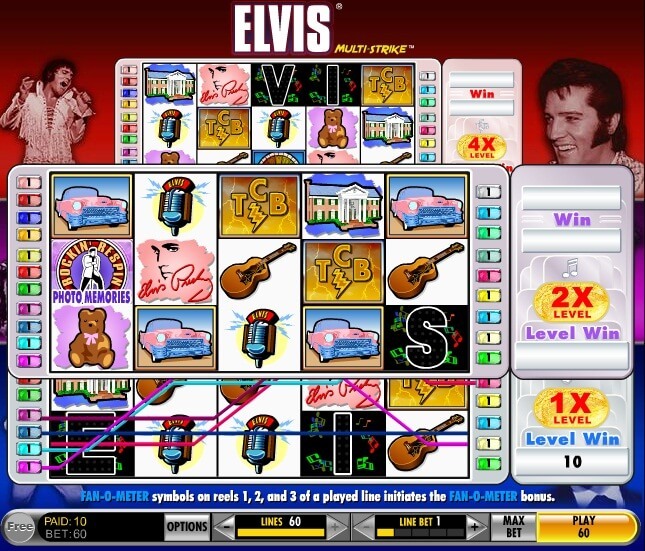 When triggered, this feature takes players to a new screen where they can spin one of Elvis’s records. Players collect any prizes the record lands on until the arrow stops at collect. Then the feature ends. The Multi-Strike mentioned in the game refers to the multiple levels that can be activated within the game that will reveal more pay lines. On the first level, the level you start the game in, you can wager on pay lines 1-21. On the second level you can also wager on lines 22-41 and lastly on the third level you can wager on up to 60 pay lines. You will advance to higher levels each time you land a winning combination or activating the free ride feature. When you are playing on the second level, all wins will be doubled. On the third level, all wins are quadrupled. Levels are activated consecutively. Each new spin starts at level 1. The Rockin’ Respins are triggered when two Photo Memory symbols land on the first two reels of this Aristocrat pokies game. The reels will now stay in place with any wilds becoming sticky, the reels are then re-spun. Four Rockin’ Respin symbols on the reels will trigger a 3x multiplier to be attached to any re-spin wins. The Symbols that appear on the reels are made up of microphones, a guitar, a Teddy bear, a mansion, a sketch of Elvis and a pink Cadillac. These symbols all pay between 5 and 500 coins for three or more matching symbols lined up on an active pay line. The letters that make up Elvis’s name will pay out coins if they are lined up in order on a pay line. An E is worth 2 coins ,EL is worth 30 coins, ELV is worth 100 coins, ELVI is worth 1000 coins and ELVIS is worth 10 000 coins. The Fan-O-Meter bonus is triggered by the Fan-O-Meter bonus symbols. If you line up three of them on an active pay line, you will be taken to a new screen. On this screen there will be five television screens, each playing a live performance from Elvis. You can select one video to play. The Fan-O-Meter will measure the loudness of the audience and award bonuses. If the cheers are loud enough, players will get an encore and can pick another performance for more bonuses.